It’s time for Christmas cookies. Truly, this is one of my favorite cooking moments of the year. Long before I went to cooking school….or began cooking professionally….I made Christmas cookies. Not just any cookies, but small, labor-intensive, carefully molded and formed cookies. My love for them has not diminished over the years. No matter how busy I am cooking and baking professionally, I always try to carve out time for baking at least one or two old favorites. I have shared many of these special cookies here on my blog…and will continue to do so every holiday season for as long as I continue to maintain a blog. 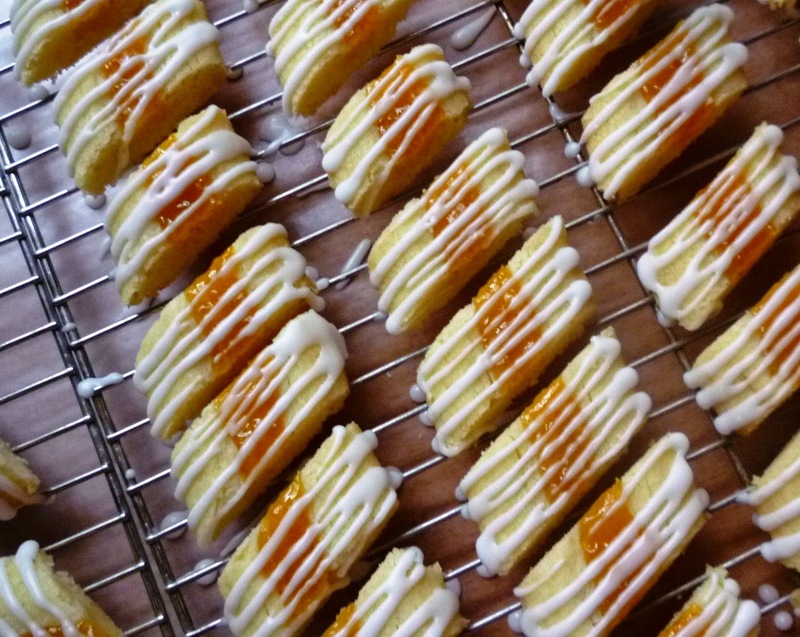 This year I want to share my recipe for Swedish Ribbon Cookies. Swedish Ribbon Cookies were not something I grew up making. I had never even heard of them until well past my college years. They were in fact the result of a search for a bar cookie that occasionally showed up on the dessert table in the dining hall of my Minnesota college. The bars had the rather odd name of “scar bars”. They were hefty, almond-scented slabs—somewhat like a cross between a sugar cookie and shortbread—topped with streaks (“scars”) of raspberry jam and drizzled with a powdered sugar glaze. Their flavor was addictive and I always wanted the recipe. It never occurred to me to ask. When I moved out on my own and began to cook and bake in earnest, I ran across a recipe for Swedish Jelly Slices in Maida Heatter’s Book of Great Desserts. As I looked at the recipe I realized I was looking at a variation of my beloved dining hall cookie. It made sense to me that the cookies I had loved in college would have Swedish roots (many of the traditional baked goods in Minnesota are of Scandinavian origin). Furthermore, everything about the recipe—the simplicity of the ingredients…the almond-scented dough… the jam-filled grooves on the surface of the cookies….and the powdered sugar glaze—told me that even though these weren’t “the” cookies…they were probably the “original” from which the food service-appropriate pan cookies had been derived. Once I had a better working title for my cookies (I’ve never located a recipe for something called “scar bars”) I began searching for other recipes. I found that the cookies go by many—similar—names: the aforementioned Swedish Jelly Slices, Swedish/Scandinavian Ribbon Cookies, Scandinavian Raspberry Ribbons….etc. Recently, I ran across a recipe in Fine Cooking for this cookie going by the name “Raspberry Diamonds”. No matter the name, the cookies are all pretty much the same: Butter, sugar, egg yolk, almond extract, flour and salt are made into a malleable dough that is formed into ropes or flat bars that are filled with a bit of jam before being baked and then sliced at an angle to form petite little diamond-shaped cookies. 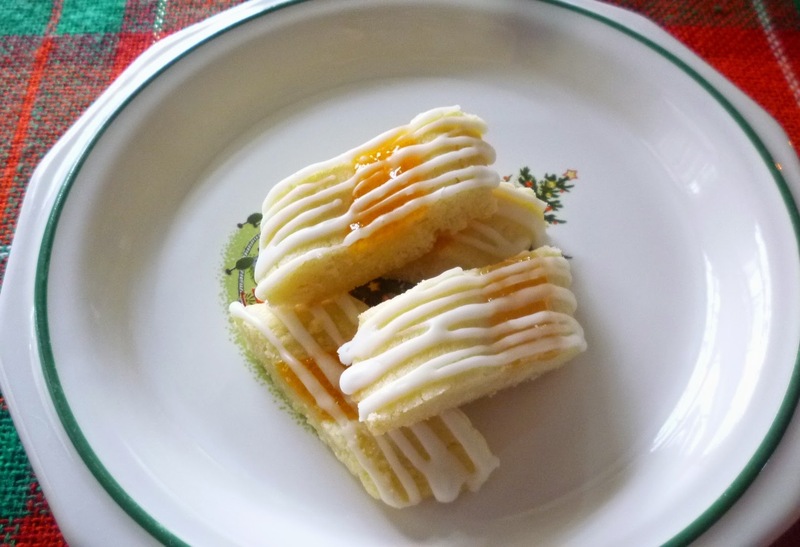 Occasionally you will find a recipe that includes some lemon zest…and sometimes the dough is flavored with vanilla instead of almond…but the recipes really are all quite similar. I believe that my recipe is a combination of several that I found. It has been so long, I am unable to cite the exact source…I only know that I have multiple printouts of very similar recipes, all stashed in among the pages of Maida Heatter’s book. You have probably noticed that my cookies are filled with apricot instead of raspberry jam. I used to make them with raspberry, but I discovered years ago that while this gives a festive, Christmas-y color, the red color of the jam bleeds into the powdered sugar glaze when stored for longer than a day. This is not the end of the world, but I don’t find it to be terribly attractive…and Christmas cookies should be beautiful, after all… Since apricot jam doesn’t have this problem (at least, if it does, the color is so pale it isn’t discernible)…and since it is a sufficiently traditional option…I began making them with apricot jam several years ago. You can of course make yours with raspberry jam…just be warned you will end up with a marbled pink and white glaze after a day or so. One of the things I love about these cookies is how easy it is to produce beautiful, uniform, neat and precise cookies. I have given detailed instructions for how to get these results in the recipe, but I want to point out a couple of things here. First, don’t make these cookies too big. These aren’t the scar bars of my college dining hall days….these cookies should be dainty and petite. If you make the logs too large (fat), you will be tempted to use too much jam and the cookies will tend to want to break in half. Secondly, even if you are careful to make the logs nice and small, you might still be tempted to use too much jam. Notice that the recipe only calls for a quarter cup….this is less than a tablespoon per log. The cookies shouldn’t be gooey with jam….they should have just enough to give a tart, fruity accent to the tender, almond-y cookie. If you remember that you are laying a ribbon—not a river—of jam, you should be fine. Hopefully I will have time to post more recipes for Christmas cookies or candies this year. But if it happens that I don’t, I have posted many favorites—old and new—over the past few years. I hope you will take a moment to have a look. 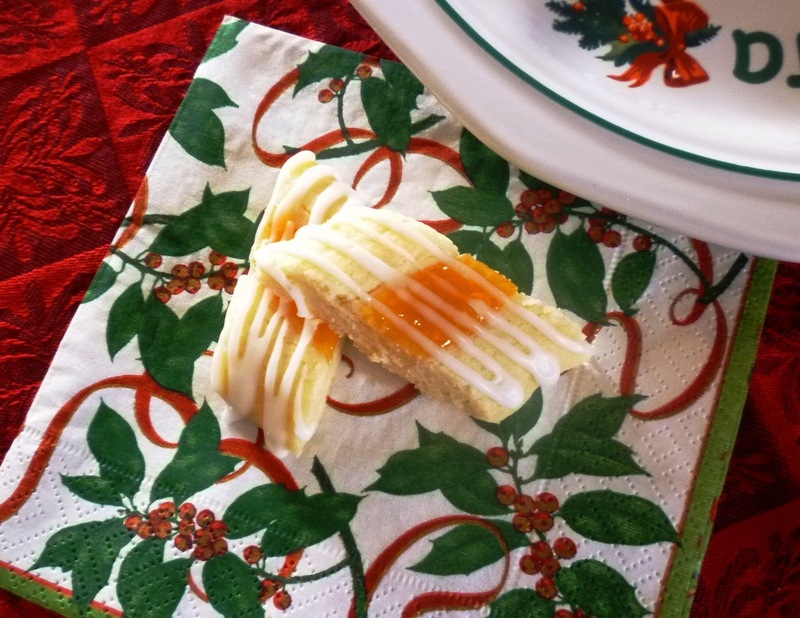 The variety is great, so there is probably something there to please almost every style of holiday sweet tooth. Happy Baking. 1/4 c. strained jam—Apricot, Raspberry, Lingonberry, etc. Beat the butter and sugar together until creamy—don’t over-cream or the cookies will spread too much. Beat in the egg yolk and the almond extract. Stir in the flour and salt and mix until blended. 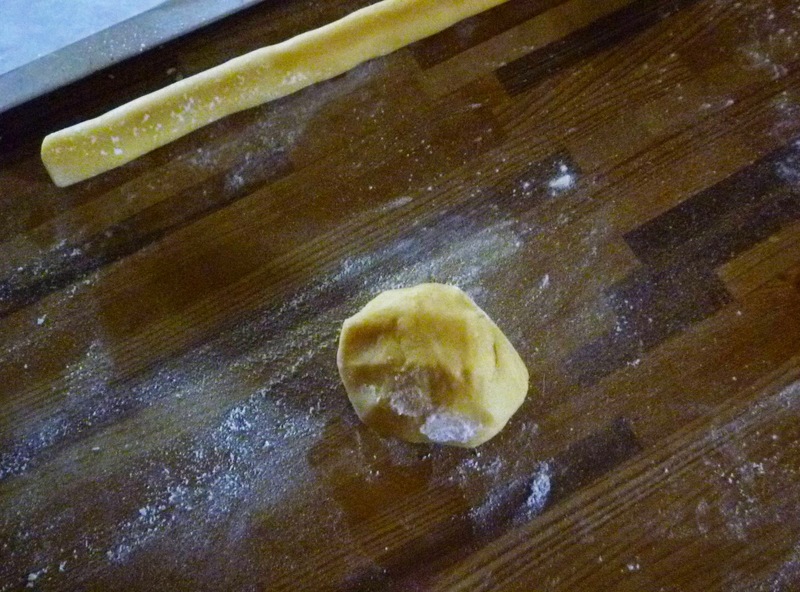 Divide the dough into 5 pieces. Roll each piece into a log that is about 12 inches long and a scant 1-inch in diameter. Place the logs 2 inches apart on an ungreased or parchment-lined baking sheet (these cookies bake best on insulated cookie sheets). With the side of your little finger, make a narrow, shallow trench down the length of each log, leaving a little space at the ends so that the trench is closed at both ends. Do not make the trench too deep or the cookies will not hold together after they are baked and sliced. Bake the logs in a 350° oven for 10 to 12 minutes—they should be just set and not have a wet/raw look to them. While the logs bake, place the jam in a small zip-lock bag and seal. Remove the cookies from the oven. 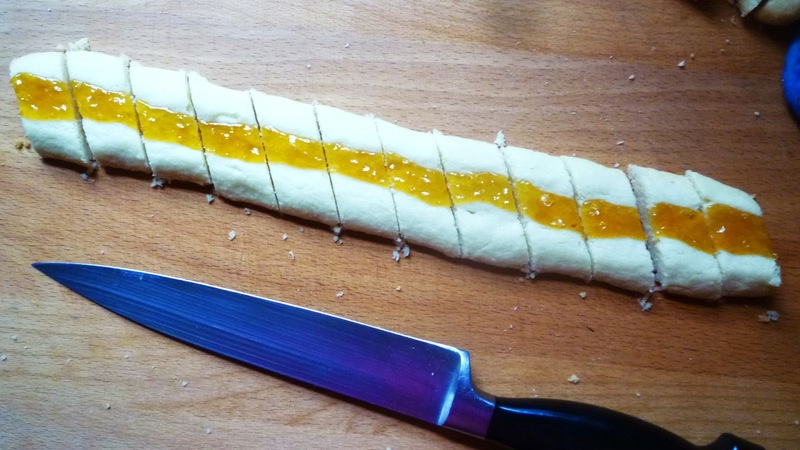 Cut a corner off of the zip-lock bag and pipe a thin (about ¼ inch wide) strip of jam down the length of each trench. Return to the oven and bake until the logs are firm to the touch and golden brown at the edges and the jam is bubbly—another 7 to 10 minutes. Cool the cookies on the sheet for 5 minutes. Using a long offset spatula, transfer the logs to a cutting board. 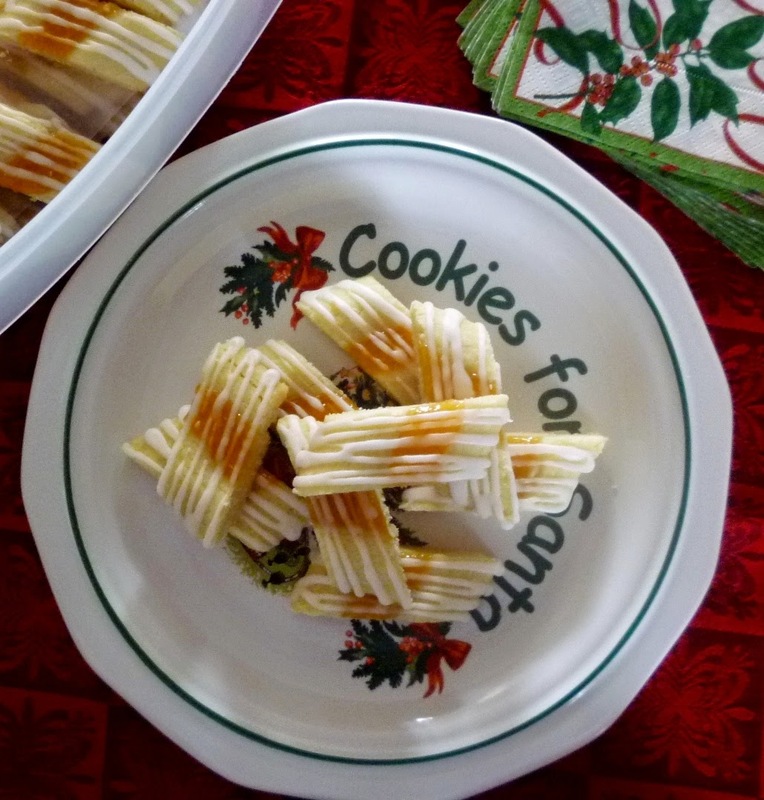 While the cookies are still warm, cut at a 45° angle into 1-inch lengths. Finish cooling on wire racks. Combine the powdered sugar and lemon juice. Add enough water to obtain a drizzling consistency. Drizzle or pipe the glaze over the cooled cookies. After the glaze has set up, wrap the cookies air tight between layers of waxed or parchment paper. Makes 5 dozen cookies. A standard sized insulated baking sheet (14” by 16”) will hold all five logs at once. When you slice the cookies, use a thin, sharp knife and wipe the blade in between each cut with a damp paper towel. I tried posting this before but am not sure whether it went through, so I'm trying again. Do you have any tips for how to roll such even dough logs? I'm terrible at this - mine always end up thin and wobbly where my fingers were pressing to roll, and thicker and kind of blobby in between, and at the ends. The thinner the log needs to be, the worse, and more uneven, my logs are. I feel like I must be missing something, because most recipes treat this as if it's the easy part. I'd love to hear any suggestions you have that might help. There are a lot of things that could be going on... Hopefully I can give a few helpful pointers. The softer the dough, the harder it is to get a nice uniform rope....and this dough is kind of soft. You might try chilling it...if it gets too firm, just work it in your hands like playdough to soften it up. When you roll it out, you want just enough flour on the counter to keep the dough from sticking...but not so much that the dough slips instead of rolling.... If it sticks, you'll press to hard....and if it slips, you'll press too hard...and pressing too hard is most likely what's causing the difficulty. Also, try using your palms more than your fingers....and use light, even pressure as you roll...moving your hands back and forth along the rope and applying more or less pressure at the thicker and thinner parts. If you think about it, it's the counter that's shaping the surface (not your hands)....your hands are just there to keep the dough moving and to help the counter do its job. Thanks for this! I'll definitely try these tips next time, particularly keeping the dough colder, and rolling with my palms, not my fingers (I know I've tended to use my fingers, maybe to avoid sticking). Do you have any suggestions specifically for rolling a log that is quite a big longer than the length of my two palms together? That's when things tend to really deteriorate - if I keep my hands together in the center, the ends start to flop, and if I spread them I get thick uneven lumps in the places where my hands aren't. The longer the log gets, the more uneven it gets. Perhaps colder dough will help with this, but I wonder how you tend to position your hands as the log gets longer and longer. I guess I keep my hands moving in and out along the length of the rope--always using very light pressure. I spread my fingers wide (like playing octaves on a piano) and at that point it is mostly my pinky finger and thumb and the pads of my palm that are in contact with the dough as I roll. It's kind of hard to dissect. I honestly think the most important thing is using very light pressure. I hope this helps! I was so excited to see these on your blog! I have been making them since college as the recipe was in a little cookbook I received for college students. I have never seen them anywhere else, but they are my family's favorite cookie. My recipe makes just 1/2 yours, and my little family has to try hard not to eat them all on a Sunday evening. It really is hard not to eat a lot of these! And I think it's fun that we both discovered these great cookies when we were in college!